LUCY BURDETTE: Are you stumped about stuffing your favorite foodie’s stocking? Puzzled about holiday books for mystery lovers that will slide right into a sock? We have a few suggestions of books and delicacies to delight everyone on Christmas morning…I've included suggestions from my foodie friends, Krista Davis and Cleo Coyle, who both had books out December 2, too! 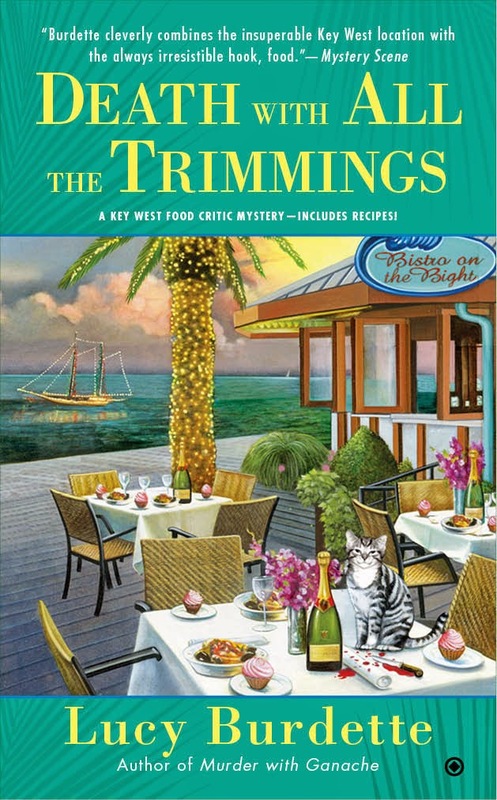 In my fifth Key West food critic mystery, DEATH WITH ALL THE TRIMMINGS, it may be Christmastime, but thoughts of peace on earth, good will toward men, don’t seem to extend to the restaurant business. Food critic Hayley Snow has been assigned to interview Edel Waugh, chef/owner of Key West’s hottest new restaurant. But off the record, Edel reveals that there’s been sabotage in the kitchen and asks Hayley to investigate. 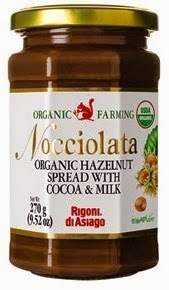 As for immediately edible treats, I'm mad for Nocciolato, an organic Nutella-like hazelnut spread that I use to make fudge (about $10.) I took the fudge when we were houseguests at our son’s prospective in-laws’ home—it was an instant sensation. KRISTA DAVIS: Thanks for including me! The newest book is called THE GHOST AND MRS. MEWER, but I have a Christmas book perfect for stockings too. In The Diva Wraps It Up, it’s beginning to look a lot like murder. When the neighborhood cookie swap turns deadly, domestic diva Sophie Winston has to wonder who’s naughty or nice. One dozen cookie recipes and two holiday alcoholic beverage recipes included! For foodies, I recommend Theo Pink Salted Caramels: Perfect caramels are enrobed in dark chocolate and sprinkled with exactly enough pink sea salt. About $7.50 for four little mouthwatering wonders. I added a box to our tip for the garbage collectors last Christmas, and our trash cans haven’t been tossed to the curb since. RHYS BOWEN: My Royal Spyness mystery series includes a book called The Twelve Clues of Christmas. In this book I’ve recreated the old English Christmas at a country house (with the addition of a few bodies). Food is an important element in this book, with traditional sausage rolls, mince pies, and of course the Christmas pudding, served flaming with a sprig of holly in it. My gift for a foodie would be a Cross and Blackwell’s miniature Christmas pudding. Almost as good as home-made and you just need to microwave it, not spend hours making it. And with the addition of brandy poured over it and the sprig of holly, you can have your own Olde English Christmas. HALLIE EPHRON: Great gift book ideas. I'd add, even though it's so big it'll probably bring your Christmas stocking crashing down from the mantle, "The Big Book of Christmas Mysteries" edited by Otto Penzler is a mix of classic and contemporary tales. Just be careful not to fall asleep reading it -- it could fall over and break your nose. And for writers on your list, you can't do better than the anthology of essays our own Hank Phillippi Ryan edited, "Writes of Passage" in Sisters in Crime's Writing Life Series. And I recently discovered a fantastic candy maker in Dorchester, MA (think Dennis Lehane) -- Phillips Chocolates. They roast their own nuts, make their own caramel, and assemble fabulous turtles. Make someone happy. HANK PHILLIPPI RYAN: Thank you, Hallie. Yes, WRITES OF PASSAGE is the perfect gift--it's beautiful, thanks to Henery Press, and the essays are generous and lovely and incredibly valuable. A perfect gift for anyone who is even thinking about writing. Whoa. I want those caramels from Krista. CLEO COYLE: For coffee lovers, a premium package of coffee makes a lovely gift. This year, Marc and I are excited to be giving our very own blend, "Billionaire's Blend," which was created by Holly O'Connor of One Good Woman Fine Coffees and Teas and her master roaster Shane in honor of our visit to their store in Eastern PA. The name of the blend is taken from our Coffeehouse Mystery, Billionaire Blend, and the customers liked it so much that Holly and Shane decided to keep roasting and selling it. Giving someone a gift with the word "Billionaire" in the title is a real hoot. And while this delicious blend is rich, the price is not (under $15.00 a pound, which is a good deal for premium, small-batch roasted coffee). To order it for yourself, simply call the toll free number at their shop 1-866-610-2872. Their staff is incredibly warm and friendly and they excel at fulfilling special orders. May you drink with joy! Reds, have you found anything wonderful on your shopping excursions this year? Ah, what fun! My book gifts are all wrapped, so no stocking books but the delightful delicacies sound perfect. And the special coffee sounds so good. Wonderful finds? ribbon bookmarks, finger lights for the children . . . .
Great gift ideas! I'm already giving Death with All the Trimmings to a friend for Christmas, Lucy. The Theo Pink Salted Caramels sound delicious, so I'll have to check them out, Krista, along with The Diva Wraps It Up. Rhys, The Twelve Clues of Christmas is a wonderful Christmas read, and I'd love to try one of those puddings someday. Hallie, I bought The Big Book of Christmas Mysteries for myself for Christmas. It's in my bag-o-books I get myself. 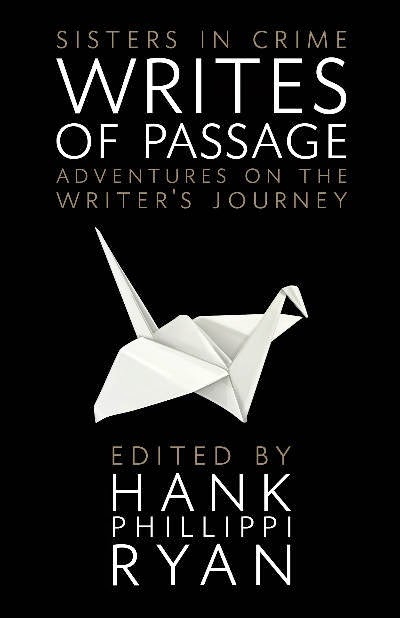 Hallie and Hank, I already have Writes of Passage staring at me on my shelf waiting to be read. 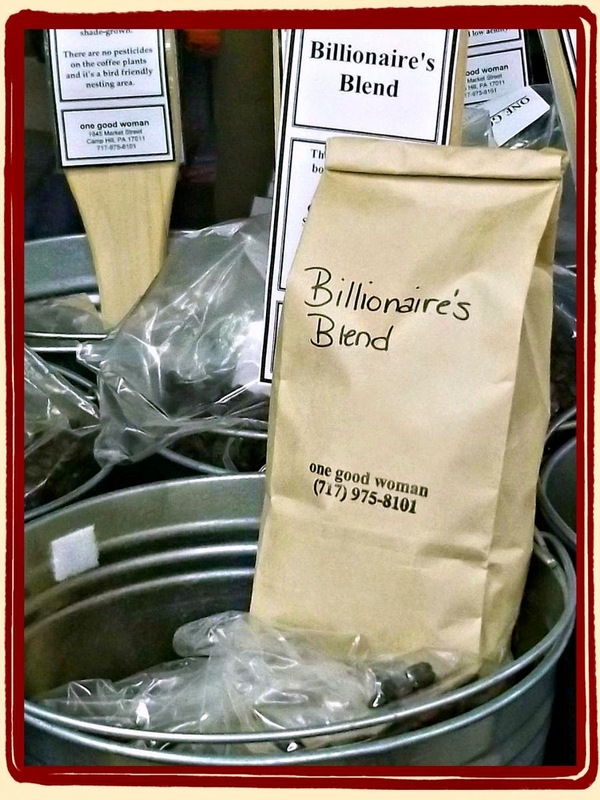 Cleo, I'm a coffee addict, so the Billionaire's Blend sounds like a great item to give and receive. I still need to go to my daughter's and pick up some fudge made by a friend of hers at the friend's Three Chicks Fudgery. It's so yummy! Several friends will receive this treat. I have a couple of books yet to buy, but I'm pretty much through in that department. I just found out tonight that my son and his girlfriend will be sleeping over at my house on Christmas Eve, so I get to do one of my favorite Christmas things, which is to fix stockings with candy, fruit, and a few little surprises. Whee! So excited. I miss having someone to put stuff out for on Christmas Eve. Penzey's Spices, which originated in the Milwaukee area and now has stores throughout the country and a website from which one can order, has lovely gift boxes of quality spices. https://www.penzeys.com/shop/gift-boxes/ And I sometimes bring a jar of a favorite spice, like their Chili 3000, as a hostess gift (even their Kashmir Saffron when I can afford it-- a jar is more expensive than many bottles of wine). Joan and Kathy--you are so far ahead of me--your gifts sound perfect! Ellen, I keep forgetting about Penzey's--great suggestion! I love Penzey's, too! Northwood's spice is just amazing. And I order vanilla beans so I can make my own vanilla extract. I should let you know that Theo's changed things up a little this year and there are six wonderful chocolate covered caramels in each little box. I have to recommend Enstrom's Toffee. Made in Colorado, but better than any almond toffee I've ever tasted across the pond. http://www.enstrom.com/ And a pound box would just fit in a stocking. My favorite gift to give is bars of the Rosemary Almond Sea Salt Dark Chocolate from Chocolats Latour, a local Cincinnati artisan chocolatier. It's the very best chocolate I've ever had, and I have had a square (or more) of dark chocolate every single day for nearly 28 years. I know it sounds weird, but you can't imagine how delicious this combination of flavors is. Each of my three daughters this year is receiving a copy of Molly Wellman's charming book, Handcrafted Cocktails. She's a local author/mixologist/punchhouse owner, and she signed copies of her new book for each daughter at this year's Books by the Banks. Which I then proceeded to give to the wrong daughters. All three of them. Cleo, I was at a bookstore on Cape Cod last night--and a customer said you were her favorite author! Joan, what's a finger light? I'm a Penzy's fan, too. And I do need some dried chipotle peppers... and I'm a sucker for Sees Toffee. And I need vanilla beans! I always forget to order until it's too late. Debs, love your book idea! Thank you for telling me that, Roberta. It makes me feel a lot better! This Post makes me hungry. Now I need to find some goodies and hunt up some of these books. I asked the very same question when one of the grandbabies put them on his Christmas wish list. They are little ring-sort of things that you can fasten around your finger [or, according to the package, around a tool or a writing instrument] or anywhere else you need a little extra light . . . .
A good book with goody recipes. Can't ask for anything better. Before I read this post, I thought I had done enough Christmas shopping but now I want to go online and order some of the things (well, the candy anyway) that all of you raved about. I think that it is our duty to find the most perfect chocolate combination and how else but try it. :) I also buy Penzey's for myself and for gifts and I love all of them. The little jarred sets make great hostess gifts for sure. There is also a big following in our area for Cleo's Coffeehouse series. And on Monday morning, I am going to order some of the Billionaire Blend coffee too. Love my coffee!!!! Merry Christmas everyone.